After the fall of the Berlin Wall, the dyadic guiding model from the Cold War Era has often been called into question. Despite widespread “posthistorical” optimism, the once exorcised diabolic ghosts are rematerializing all over again. Catastrophes like the events of 9/11, the war in Iraq, and the ongoing global financial crisis threaten the rampant turbo-capitalism, which consequently expresses its temporary willingness to adopt the perspectives of the sinister other. Now there is even talk of a nationalization of banks and key industries. The dyadic bricks encircling the third party, postcapitalism, are being laid higher and higher. The (anti)logic of a dyadic view of the world involves it, for its part, violently forcing the third party to take a stand, to be “called home” as soon as possible in a dyadic order. In the face of such tragic intolerance, many breaches of dyadic relationship forms have been undertaken: “Les parasites” (M. Serres), “The Third Space” (H. Bahbah), “Ma (Between)” (Kimura, Bin), “Túm (Gap)” (Kim, Chi–Ha) are some examples of this. Without acts aimed at transgressing and undermining the binary-coded border regime on the part of the third party, the horizon of “postcapitalism” will also remain closed to us. 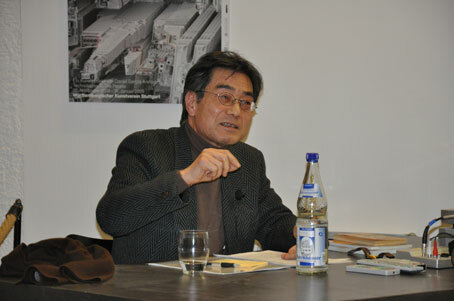 Professor for sociology at the University of Münster; born 1944 in Tokyo. Prior to naturalization in Germany (1993) he was a citizen of South Korea. He studied philosophy, sociology, and economic history in Seoul, Heidelberg, and Frankfurt am Main and earned a PhD in philosophy under J. Habermas in Frankfurt (1972) and a habilitation in sociology in Münster (1982). As a prominent political dissident against the military dictatorship and also mediator between the two enemy brother states, he accepted invitations—in September 2003 after thirty-six years of exile—officially extended by the “Foundation for Democracy” and the “Korean Philosophy Association” in South Korea, at which time he was, however, detained for violating the “National Security Law.” Thanks to worldwide protests, he was set free again after an appellate ruling in July 2004.